Sometimes, you may have thought to make ringtone for iPhone or Android in your own way. Generally, creating a song skewer is a funny thing, which can mix all your favorite music together for future listening. In other words, you don't have to switch for next one when your player happens to play one song you dislike. Good news is that there are diverse online tool developed to merge audios online. Among them, Filesmerge is a quite dependable tool for you. Let's see how it can perform. This online audio merger requires no tech skills, making the whole joining process easier. Taking the aid of it, you can get liberty to merge multiple audio files at the same time. You can see as below. Note: Even though this lightweight online audio joining tool can work well, the biggest shortcoming is that it can only supports MP3 formats for both input and output files. 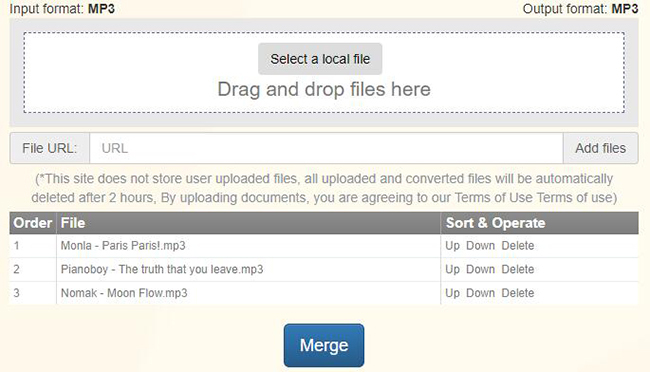 Filesmerge can allow you to upload audio files in 3 different ways: 1) Select local files from computer's hard drive; 2) Drag and drop audio files to the specific area; 3) Enter any online URL to add files. As you can see, you can adjust the order for all uploaded MP3 audio files by clicking "Up" or "Down". You can also delete the useless one from the list in a flexible manner. Having confirmed the order for all audios, you can go ahead to change some necessary parameters for output audio. Filesmerge delivers a platform for you to stylize quality, encoder, sampling rate and channels. Considering there are no further operations to do, you can hit the "Merge" button right now. This straightforward online audio merger will carry out the combining task fast. Once it is completed, you'd better download the destination audio on your local folder. Otherwise, all uploaded files and converted audio will be deleted automatically after 2 hours. Perhaps, the audio solution can give you a forthright chance to merge audio files in batch; it can do nothing when it comes to cut and merge songs online in other formats. 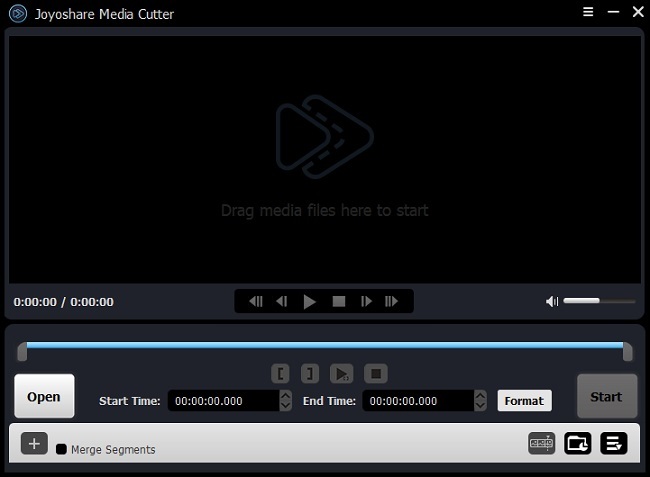 That being the case, why not try another more powerful program, called Joyoshare Media Cutter? It is capable of cutting large audio files into small pieces and merging all audio cuts together at up to 60X faster speed. Notably, its full compatibility can as well enable you to import any types of audio files, like MP3, M4A, AAC, AC3, OGG, AIFF, APE, FLAC, WAV, WMA, M4B, M4R, AU, ALAC, MKA, etc. 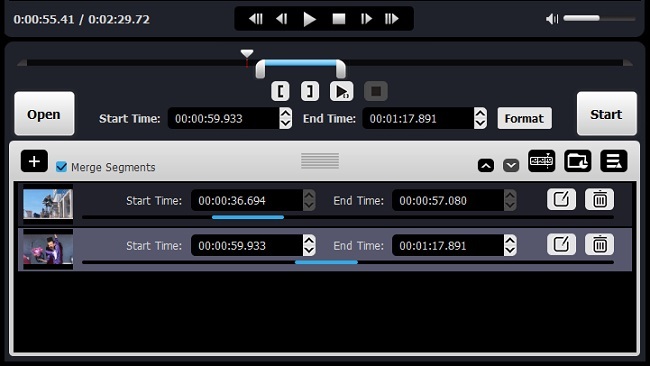 Its well-designed editing tool also facilitates you to trim certain section, change audio track, add background music, control volume and apply sound effects. Moreover, no matter what kind of change you make, you have right to pre-listen to the audio files in advance to avoid unqualified result. 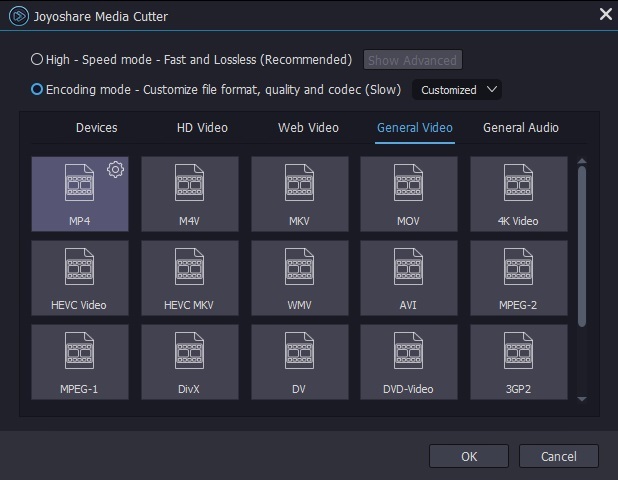 Joyoshare Media Cutter also offers ability to specify configuration info for the output audio format, including codec, channel, sample rate and bit rate. You get two accessible methods to add audio file into Joyoshare Media Cutter's main interface. Simply hit the "Open" button or directly drag the selected file. As long as the audio is loaded fully, this smart program will automatically play it for you. There are always some excess contents you show no affection, such as the head, tail, silent section, noisy segment, etc. Now you can leave out them to release more computer memory. Just set about moving the yellow sliders or putting exact time points to temporal intervals. Afterwards, you ought to press the "+" icon to produce more than one audio cuts. Locate at each one and repeat the above operation to get precise area. The "Format" panel can lead you to decide a preferred output mode. If you just want to do basic cutting and merging operations, the "High-Speed" mode is recommended. However, if you would like to take advantage of the edit button to apply sound effect, add background music, adjust volume, etc., you are supposed to choose the "Encoding" mode. This mode is able to give you a hand to customize your output format configuration, for example, codec, bit rate, channel, etc. Or you can transfer it to any portable device you exactly have. 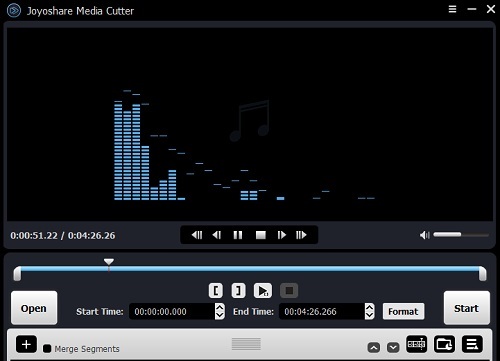 Tick the "Merge segments" option and click the "Start" button to join all your audio cuts into a new one. A short moment later, you enjoy the finished one in your destination folder and share it to anyone you like.